Phoenix Arcade is the industry leader in screen printed arcade restoration artwork since 2000! Started by Darin and Nancy Jacobs their commitment is to present the utmost highest quality products utilizing state-of-the-art commercial printing equipment. All their products are produced right here in the U.S.A. along with all inks, print media, shipping boxes, packing materials and tape are made in the U.S.A.
Phoenix Arcade needed assistance in developing their new e-commerce website utilizing a Drupal CMS and responsive design to provide the best user experience to their customers. Their mobile traffic continues to increase and they were in need of a redesign and a mobile optimized experience. Rapid Web Creations continues to support Phoenix Arcade through website maintenance, new functionality and content creation. 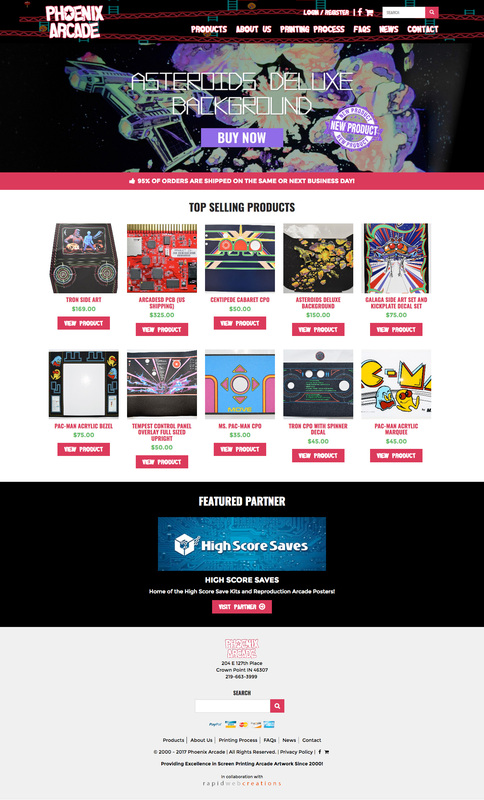 We are proud to a trusted partner of Phoenix Arcade and continue to support them in all their marketing needs.